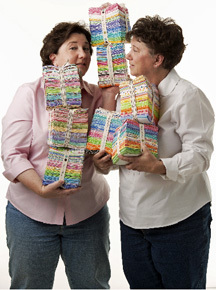 June 2011 - While attending a quilting class at a local quilt shop sisters Barbara Groves and Mary Jacobson found out the shop was for sale. They purchased it and for three years found they never had worked so hard in their lives. Selling the shop but not wanting to leave the business entirely they thought creating fabric designs would be an ideal solution. Me & My Sister Designs was born. Barb and Mary tell me they are now working on their 19th and 20th fabric collections and have branched out into designing patterns (more than 40 now) plus they have authored seven books. Both sisters are certainly creative but day to day Mary spends more time on the computer and handling the accounting part of the business while Barb does more of the customer contact. They meet in the middle though when its time to design fabrics with Mary being the diva of color selection. Barb pointed out a big part of their success is having Moda Fabrics as their fabric distributor. The duo finds the people at Moda easy to work with which leaves them time for the job they most enjoy, designing new fabric collections. Me & My Sister’s newest collection entitled “Twirl,” will debut at the quilt show in Houston this fall. It features butterflies as one of the motifs. Check out the website MeandMySisterDesigns.com and their blog to see more of the sister’s creative products and ideas.